In my last post, I wrote how happy and excited I was that we were going on a trip to visit Fort Mantanzas National Monument. There was a reenactment planned and we were all looking forward to seeing it. Imagine how disappointed we were when we arrived at the park and found that not only was the reenactment cancelled but also the ferry. It seemed that our area, in fact, the whole of north east Florida, was under a tornado warning! How could that be? The weather was a little overcast, but it was a warm spring 86 degrees, and there was nothing but a gentle breeze blowing! Ah, well. No one can control Mother Nature, she will do what she will do. We walked down to the Mantanzas River, and explored the shore a little, then decided we'd better have our picnic as everyone had built up quite an appetite by then. And after the food was consumed and our picnic supplies packed away, we walked off some calories and fat by exploring the nature trail. I took way too many photo's to share here, but I have a few of my favorites of the day. This is a view of the shore of the Mananzas River. 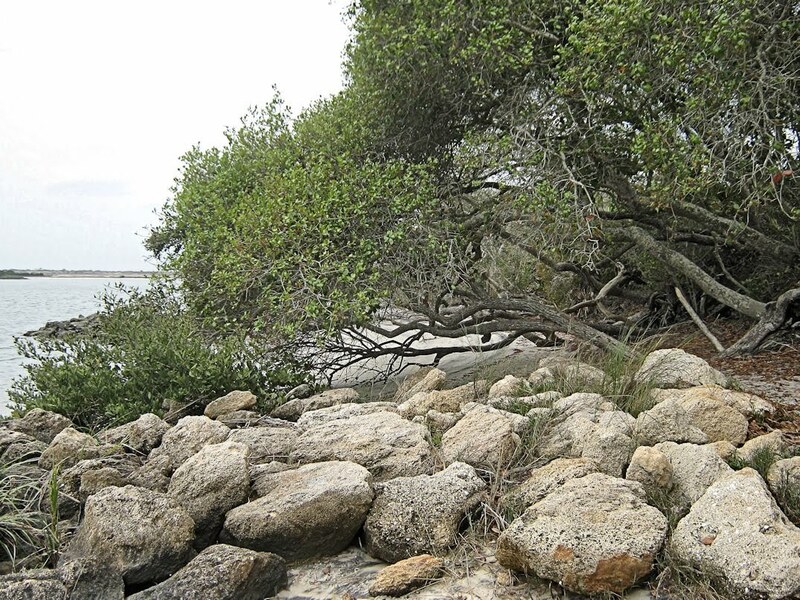 Those big boulders piled up there are coquina, and we debated about why they were piled there. I think they are lfeftovers from building the fort, which is almost right across the river from this point. 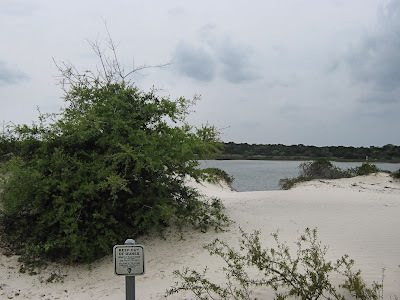 Beautiful sand dunes along side of the Mantanzas River. We reached this point from the nature trail, and it's marked for gopher tortoises, but we didn't see any. My granddaughter and I had fun picking out animal and bird tracks in the sand, and figuring out what made them. Two notable tracks we saw were those of deer and and a snake. How awesome is that? *side note: My granddaughter made a remark about how much fun it would be to go sledding on the dunes. I explained to her how bad that would be for the dunes. Even walking on the dunes disrupts the tiny plant systems that help hold the sand dunes in place, and once they are gone, the wind and water erodes the dunes. She had an 'Aha..' moment, and quickly agreed with me. 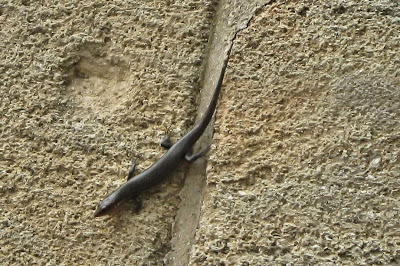 We spotted this lizard crawling down the wall outside the visitors center. 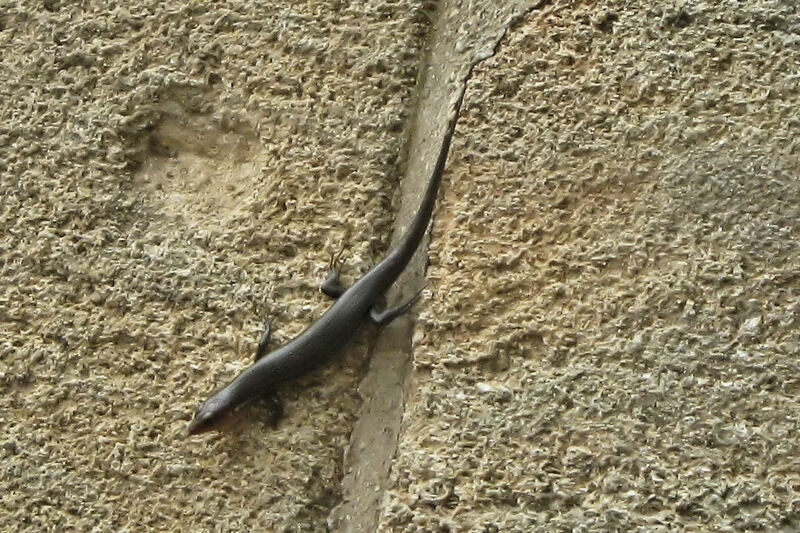 I think it's a skink, but my granddaughter disagrees with me, even though the area is known for the five-lined skink. Ah well. I have been known to be wrong before, and will be the first to admit it when I am. It was a big lizard though, at least 7 inches long! 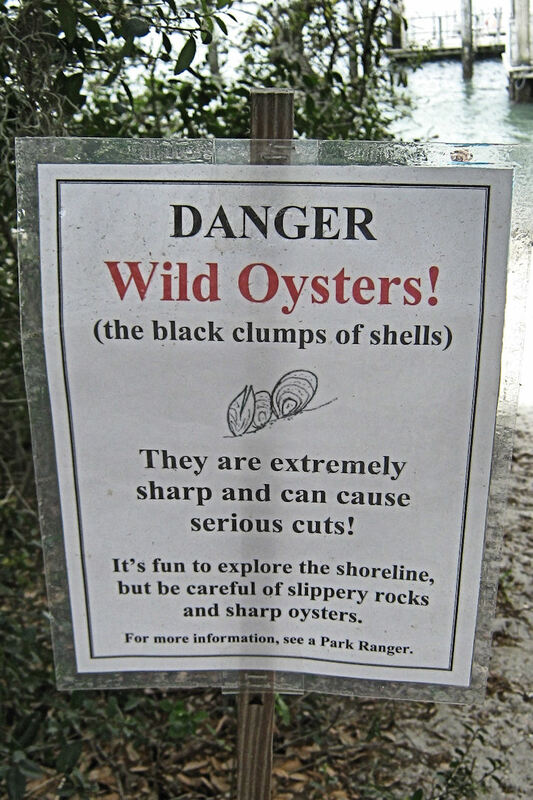 I got a little kick out of this sign! 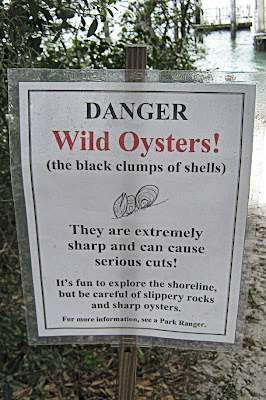 I'm glad none of us chose to wear flip flops, but the first image that came to my mind when I saw it was of little oysters chasing people along the shore, snapping at their heels! 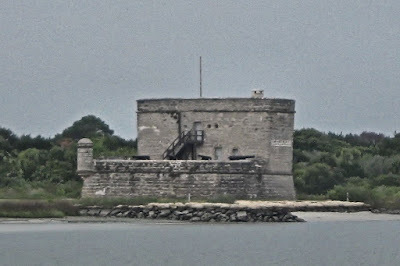 This is THE fort, Fort Mantanzas. I know it's not a very good photo, but I did the best I could with my digital camera, and it is quite a ways away across the river on Rattlesnake Island. 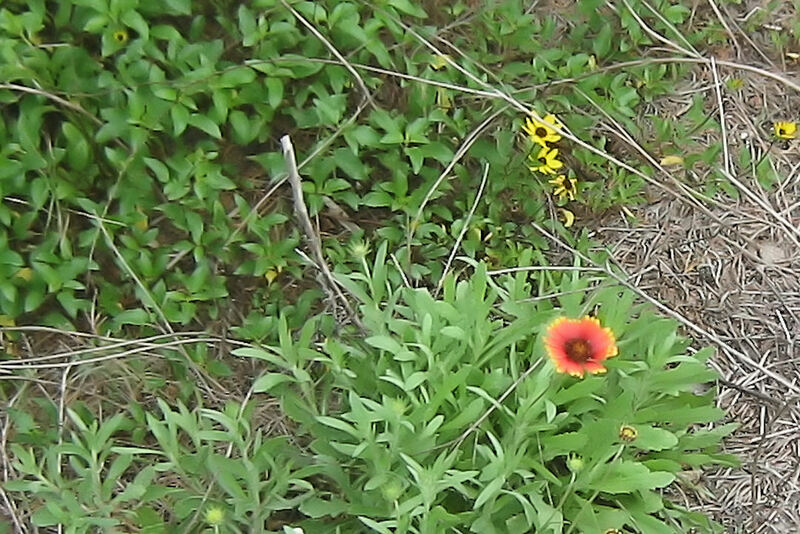 Spring has already arrived here in north east Florida, as proof, the fire flowers are blooming, along with some Black-eyed Susan's maybe? 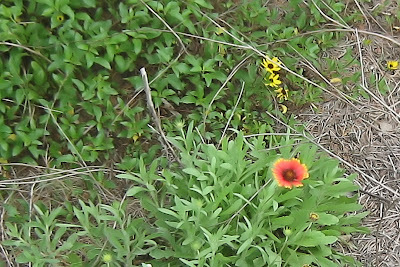 I'm not really sure what the yellow wildflowers are, but we have them blooming in our front yard, too. 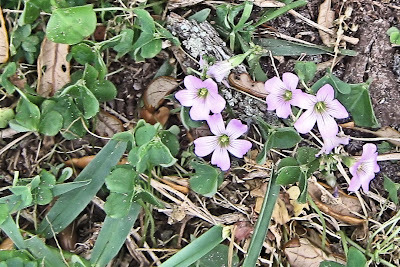 I don't know what these delicate little pink blossoms are either, but they were blooming all over the yard in front of the visitors center at Fort Mantanzas. I think they are so pretty! It really was a lovely afternoon, and I am so grateful we went when we did. I'm doubly pleased we came home when we did, too. No sooner had we arrived home and unpacked the car when the skies opened up and it began to storm. We spent the rest of the afternoon and evening, too, under the tornado warning, and much of the time with either flickering lights or no power at all. The temperature dropped over ten degrees in less than 90 minutes and I admit, I got a little nervous when the wind really picked up, the thunder was booming and lightning flashing. I got goosebumps, and was so relieved when Mother Nature calmed herself down. Today promises to be more of the same. We are under another tornado warning until 1 o'clock this afternoon. It's a good time to curl up on the couch with my hooks and yarn, don't you think? It's spring break time here, so the kids all have the week off from school. Yay!!!! 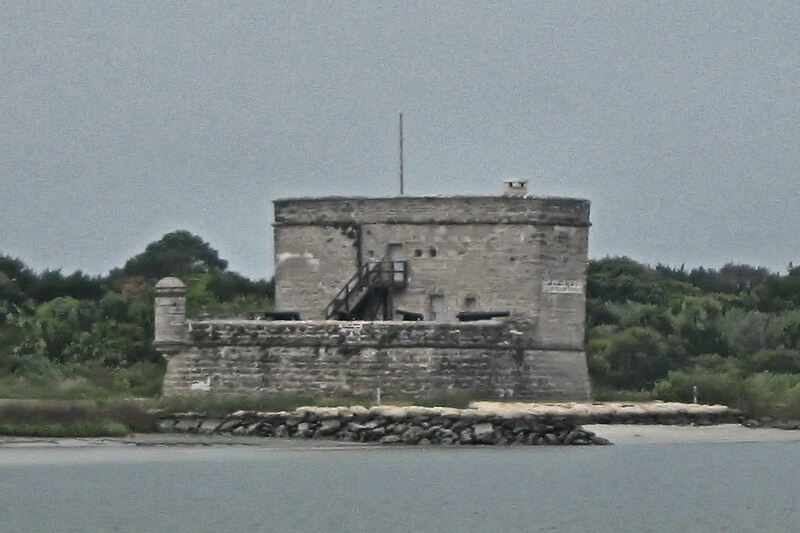 Dearest decided that today would be a good day to visit Fort Mantanzas National Monument, where they are holding a historical reenactment today. My granddaughter and I decided that it would be a perfect time to have a picnic, too. 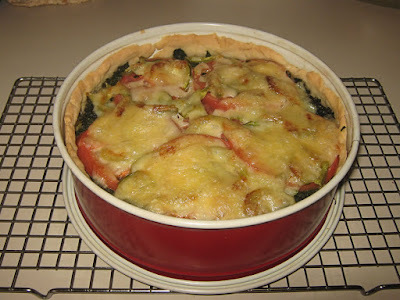 We spent the morning in the kitchen making a French Picnic Tart for our lunch. 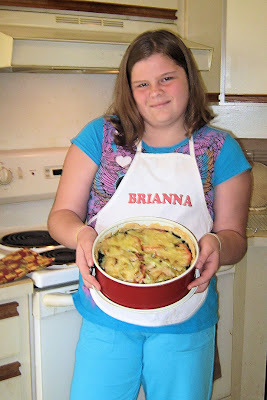 She loves cooking and baking with her NeNe (me) and she's really very good at it. She's developed a taste for what spices and seasonings go well with what foods. I'm quite proud of her. I don't make the French Picnic Tart very often as it's a little complicated and time consuming to put together, but it's also oh-so-good, so it's worth all the effort. I make a Perfect Ten pie crust, then layer cheese (this time we used Swiss, but I love Gouda in it), sauteed onions with sage, slices of crisp veggie bacon, slices of parboiled baby new red potatoes, steamed and chopped fresh greens (had to use kale this time as the store didn't have any of my favorite Swiss Chard) slices of red, ripe tomato, and then top it all off with another layer of cheese. Did I ever mention that we're vegetarians here? We're having frozen green seedless grapes as our side dish, another favorite of ours. My mouth is watering just thinking of the meal waiting for us. 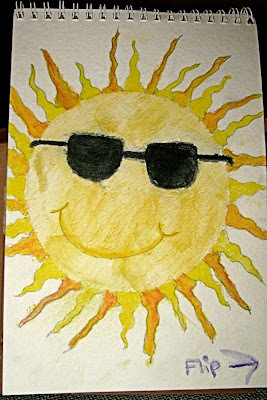 I hope you all have a wonderful, sunny, warm spring afternoon! I'm thinking you. 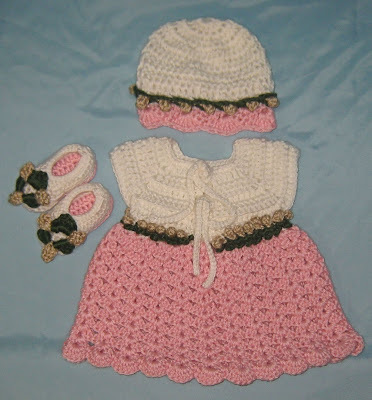 New Angel Rosebud Baby Set! I finally finished the new Angel Rosebud Baby Set that my cousin asked for. For awhile there, I was worried that I wouldn't be able to do it. If you read my last post, you'll recall that I couldn't find the pattern for the little rosebud wreath that I put on the shoes. Apparently I didn't write it down when I made them, so I had to start from scratch. I'm not sure if the new wreath I came up with is as good as the original, but I think it's pretty darn close. And the good news is, this time I wrote the pattern down!!! So without further ado, I present the newest Angel Rosebud Baby set. 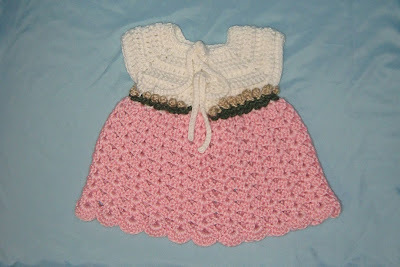 I used Heartfelt Angels - Angel Shell Dress pattern for the baby dress, again with the addition of the rosebuds and leaves. I changed the pattern again, too, opting to use ties to close it instead of the buttons as I didn't feel up to braving another visit to the store for buttons. Here's the complete set. I think it's pretty, I hope my cousin does, too. Last, but not least, the baby shoes that I agonized so much over. I love the pattern for the shoes itself, it really lives up to it's name, Easy Baby Shoes, and it can be found on Gardener's Ramblings blog here. 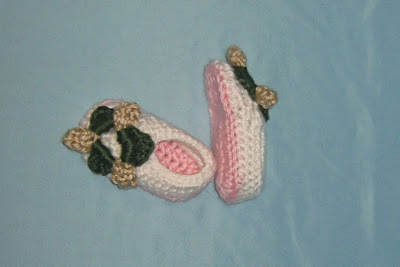 As I mentioned before, I remembered to write down the pattern I used for the rosebud wreath for these baby shoes. I feel so good about that. Now I have to wait to see if my cousin likes the way this set turned out. She requested the colors, and I should have asked her if she wanted dark brown or light brown, but I took the chance and used the light brown I had in my stash. 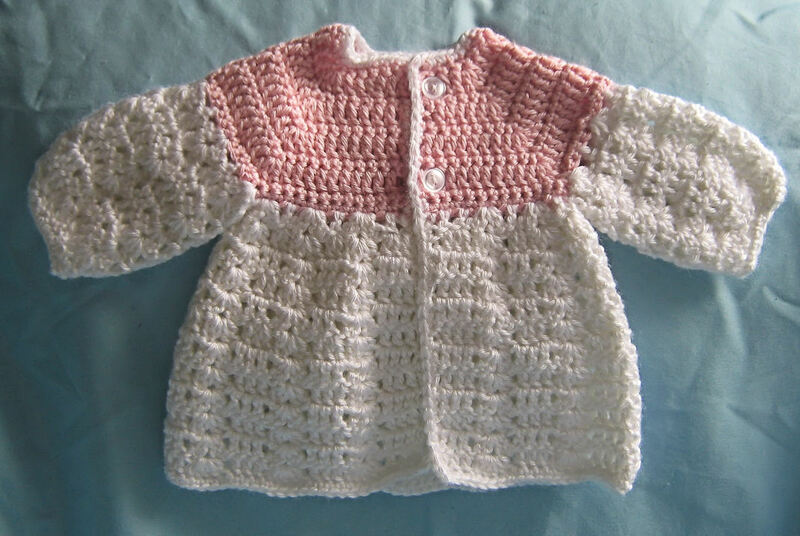 If she doesn't like it, I can always make her another set with dark brown, and donate this set IF I don'[t get any new granddaughters this year! I was very flattered when my cousin asked me to make my Angel Rosebud Baby Set for her to give to one of her newborn grand-babies. She loved the set I made, which you can see here, but wanted different colors. I had a couple of other projects to do before I could get to hers, but I finally picked up the yarn and hooks this morning to get it started. Everything was going well. I made the little dress with no problem, and the sweet hat to match. Even the baby shoes went together easier than the first time I made the pattern. I can't remember how I made the little rosebud 'wreaths' I put on the top of the original baby shoes. 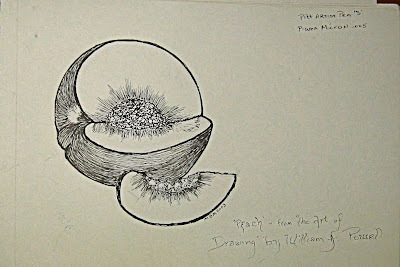 I have looked at the pictures. I pulled the pair of shoes out of the bag I'm keeping the laundered baby things in and looked at them. I searched through my documents on my computer, but nothing has helped! I'm normally pretty good about writing down patterns that I either make myself, or change from the originals. But I apparently had a brain burp when I made those little wreaths, because there's not a note to be found anywhere. I guess I'm just going to have to do some experimenting. I hope you're doing better today with your brain than I am! I can't believe the cape is almost finished! It still needs four buttons and a pretty ribbon to lace around the neck line, but other than that, I think I'm done! 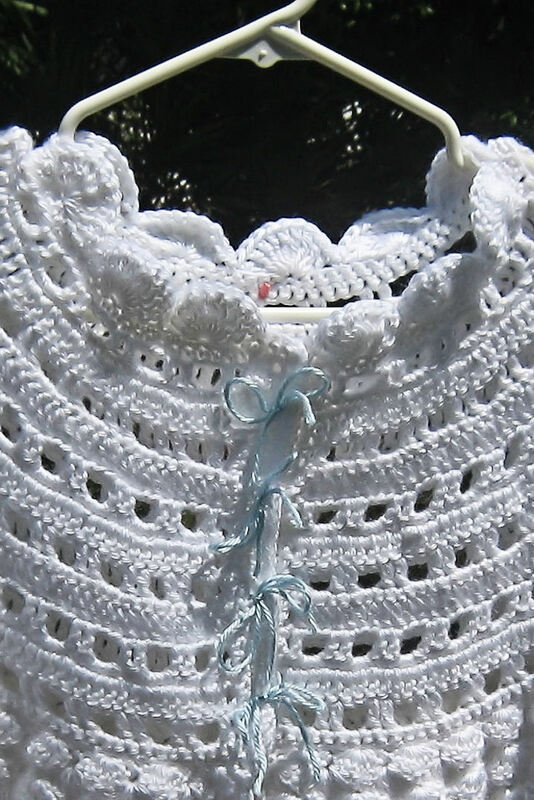 This is a close up detail of the neck and button placket. 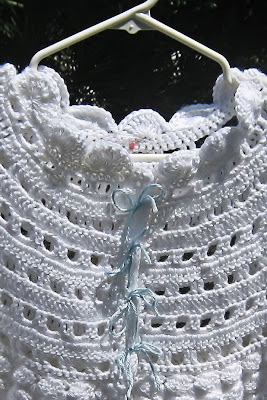 The pink colored scrap of yarn marks the middle of the back, and the blue yarn bows mark the buttonholes. Here's a picture of the (almost) completed cape. Would you believe there wasn't even a breeze until I put my shoes and socks on to go outside to take some photo's of it? The minute I put the hanger on the clothesline, the wind started gusting! 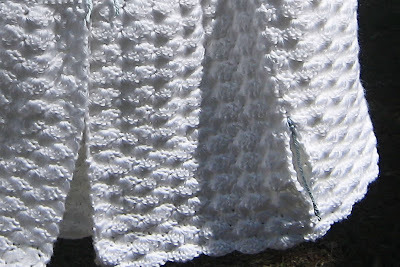 A closer view of the cape. 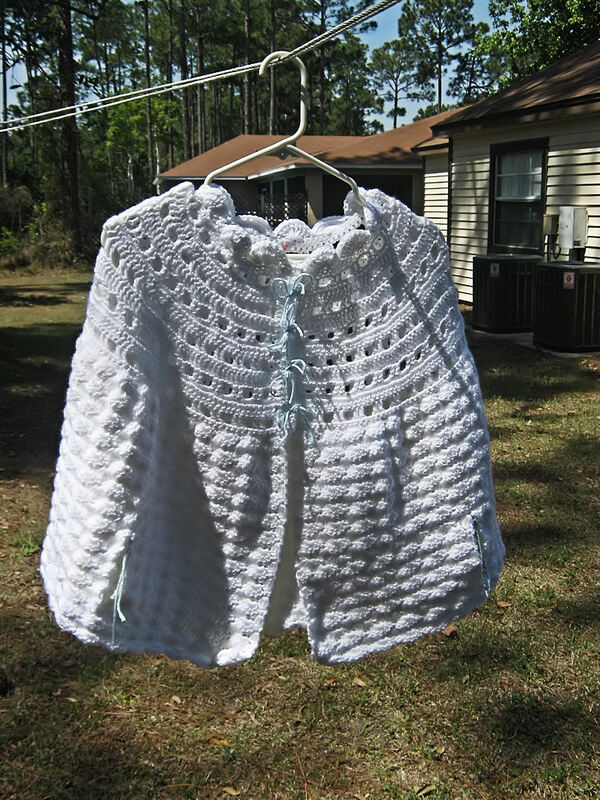 My family here thinks it's very pretty, but I have to wait and see what my great-aunt Mary Jane thinks of it, as I made it for her sister. 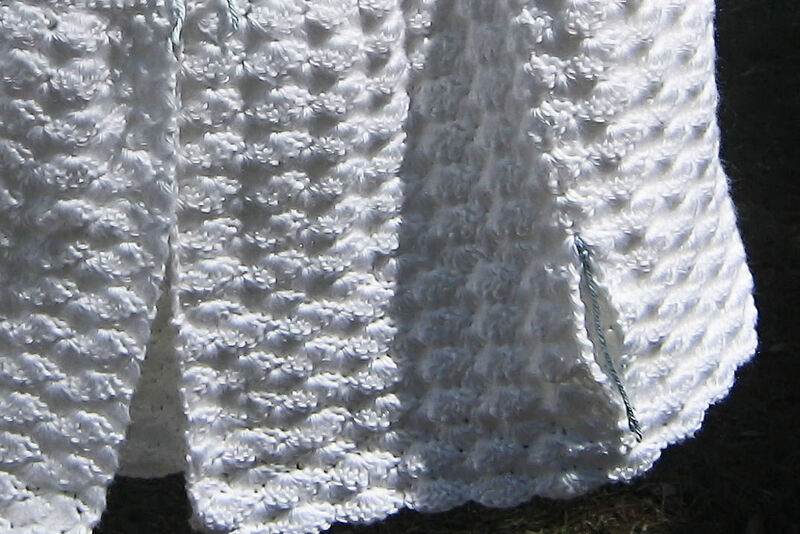 A close up view of one of the armholes. I marked the top of them with blue yarn, and haven't removed them yet as I haven't decided if I should use a border of single crochet around them yet or not. So there you have it. One Victorian-style cape, designed and made by me. I'm interested in hearing what you think of it. Forgive me, I'm having a hard time finding a crochet project to work on right now. 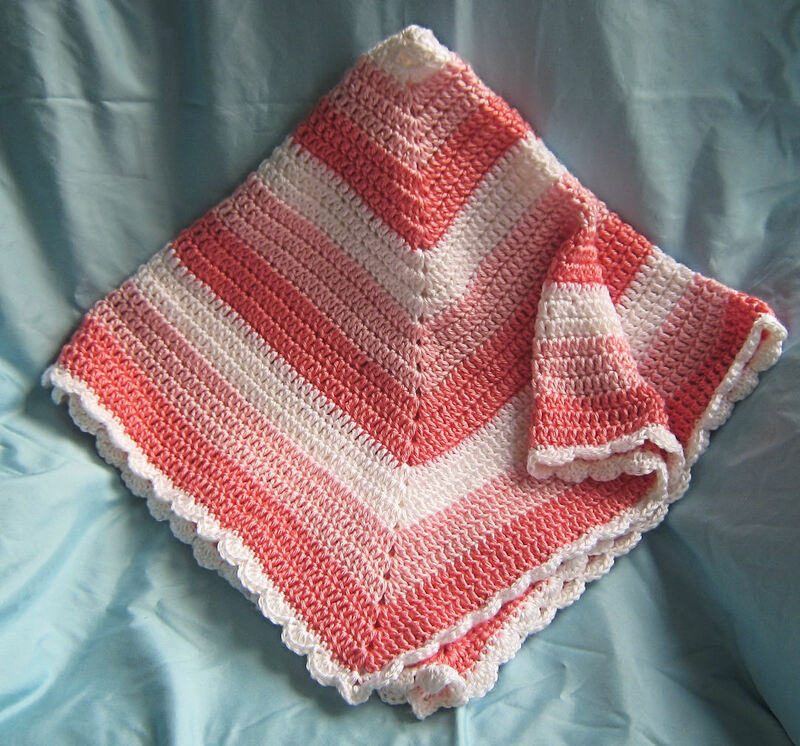 So instead of sharing my current projects, I've decided to share a pattern that I designed a couple of years ago, but never tried publishing to my knowledge. Back then, I had a thing for crocheting fun bookmarks. I love to read, and never have enough bookmarks for all the books I may be reading at one time. 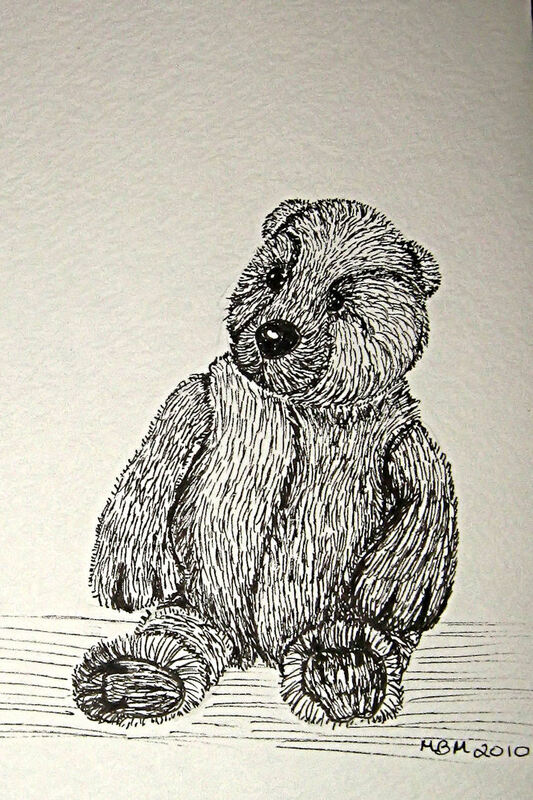 My grandchildren have an affection for some of the cuter ones I make, so I tend to lose them that way, too. 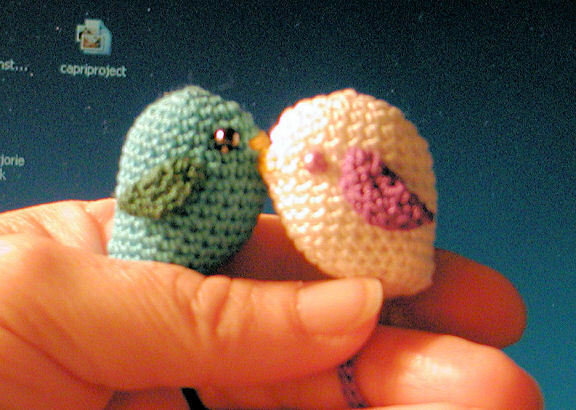 Note: This pattern is worked amigurumi style, which means that rounds are not joined. You may wish to use a stitch marker to mark the beginning of each new round. Rnd 13 - 14: sc2tog, sc in next 9, 2 sc in next 2 sc, sc in next 9 st, sc2tog. (24 sc) Do not fasten off! Rnd 17: *sc2tog, sc in next*, repeat from * to * around. (12 sc) Do not fasten off! Fasten off, leaving long thread to sew closed. Fasten off, leaving long thread. 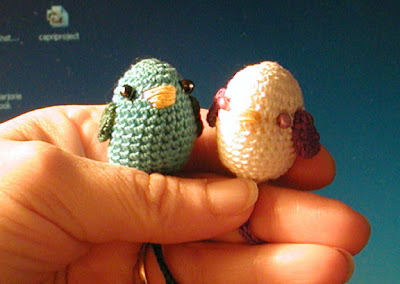 Fold in half and sew together, sew to sides of bird. ch 121, sl st in 11 ch from hook, and in remaining stitches. FO, leaving long end to sew to bottom of birdie. 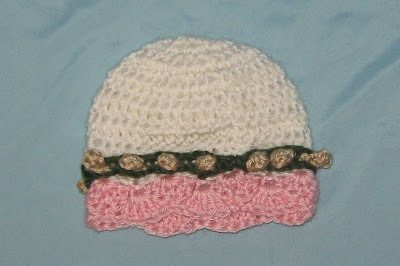 Sew tassel or large bead to end loop of thong. Just a quite update to let you know I'm still around. I ran out of white yarn with less than three rows to finish the main body of the cape design I'm making, and I have two or three days until I get my allowance so I can buy more yarn. We've had some sad news on the baby front, too. It seems one of our babies is not going to join us here on earth. A ultrasound has shown that the baby has something wrong with his or her brain, and there are other developmental issues, too. The doctors have recommended an abortion as soon as possible. I feel terrible for the mother and father, I can't imagine how that must feel. I'm trying to have faith that there will be one more baby waiting for us in heaven, but it still hurts. 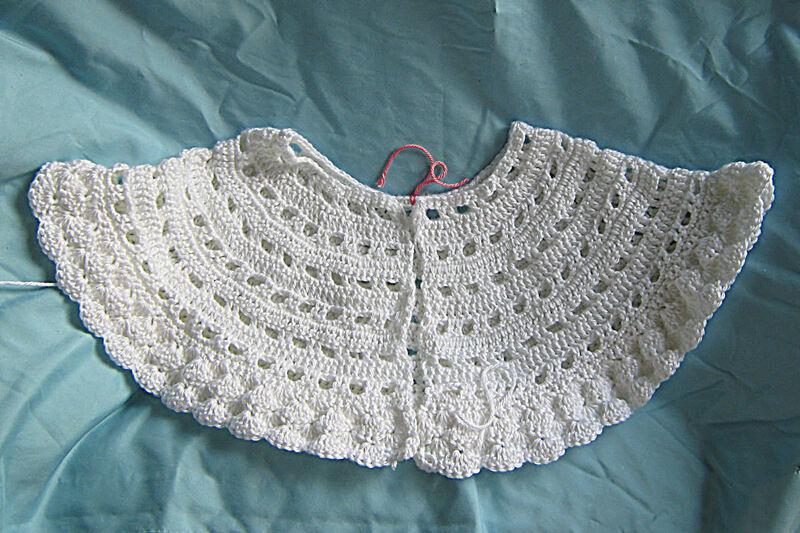 So right now, I'm taking a little break from crocheting baby things, and I have to wait to resume work on the cape. I've looked around for some other crochet project to begin, but I'm not finding anything that catches my interest. My pancreatitus is acting up to boot, nothing like an aching stomach and rumbling intestine to add more excitement to ones life. I hope life is treating you better. My granddaughter, Brianna, has expressed an interest in learning to draw and paint again, so she dragged out a bunch of my art supplies, and some samples from the classes I taught years ago. 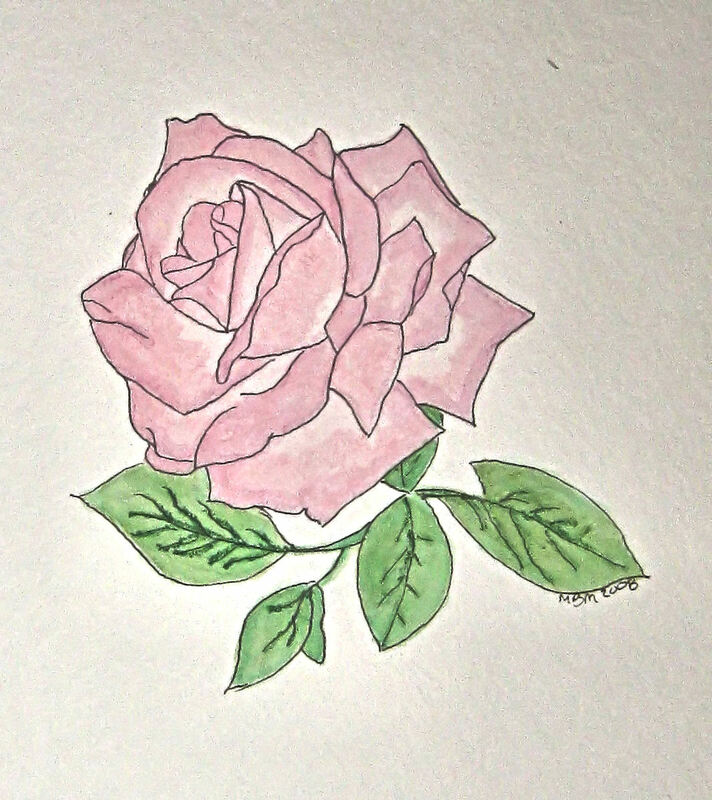 The above rose was one of my popular classes, and was done with pen and ink and watercolor. 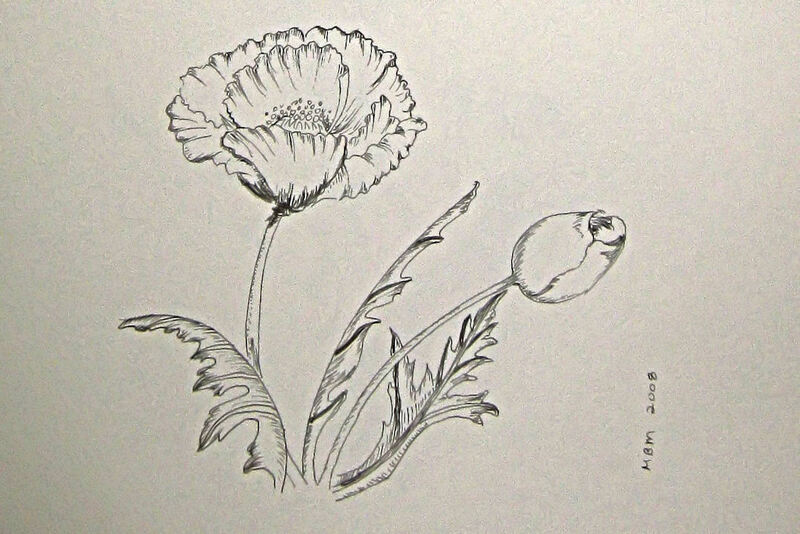 This is a pen and ink poppy study. 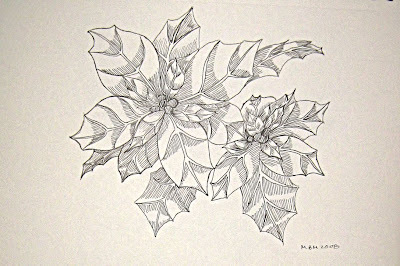 I learned to do drawings like this from free classes online, and discovered much to my delight, how great it made me feel. Talk about a confidence builder! 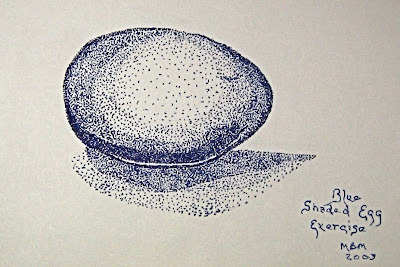 This is a pointillism pen and ink I did from a drawing I found online. 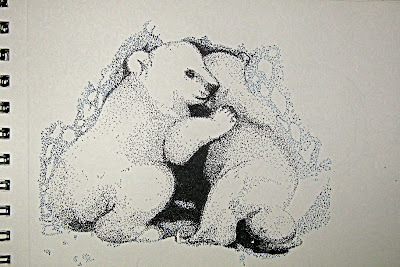 Another pointillism pen and ink with watercolor I did from a photo I found online. I love frogs! 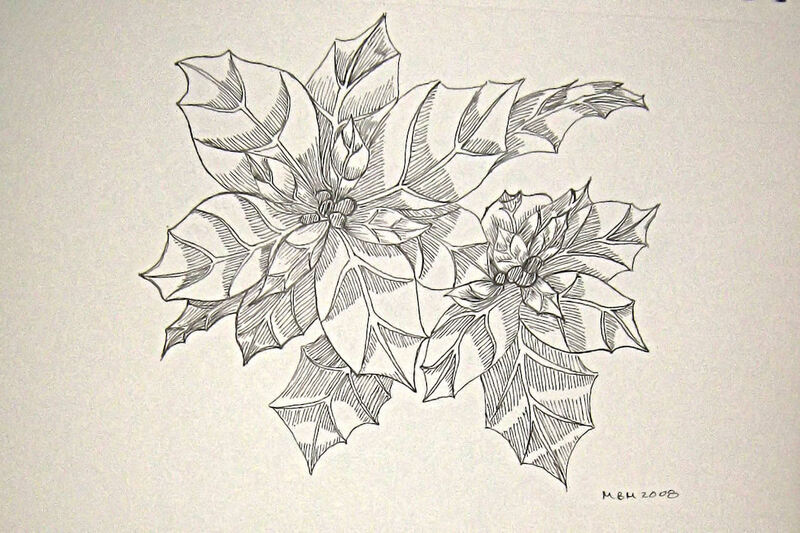 Pen and ink poinsettia done in 2008. I keep stressing to my granddaughter that drawing and painting doesn't necessarily come naturally, it's something that you really have to work at. In other words, practice - practice- practice! 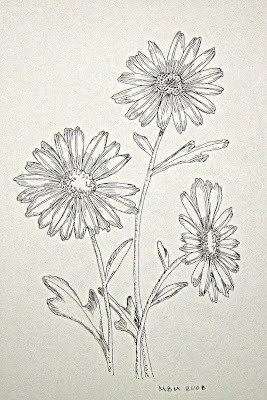 Daisy study done in pen and ink. I later did this same sketch in watercolor and pen and ink, but it was gifted to a loved one long ago. 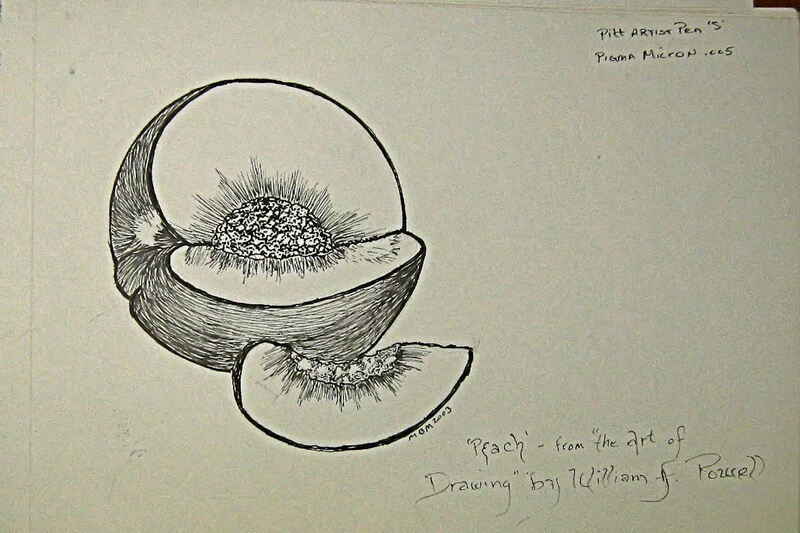 A peach study from the book "The Art of Drawing by William Powell. 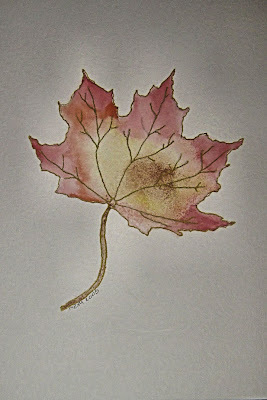 An autumn leaf study we did in one of the art classes I taught. 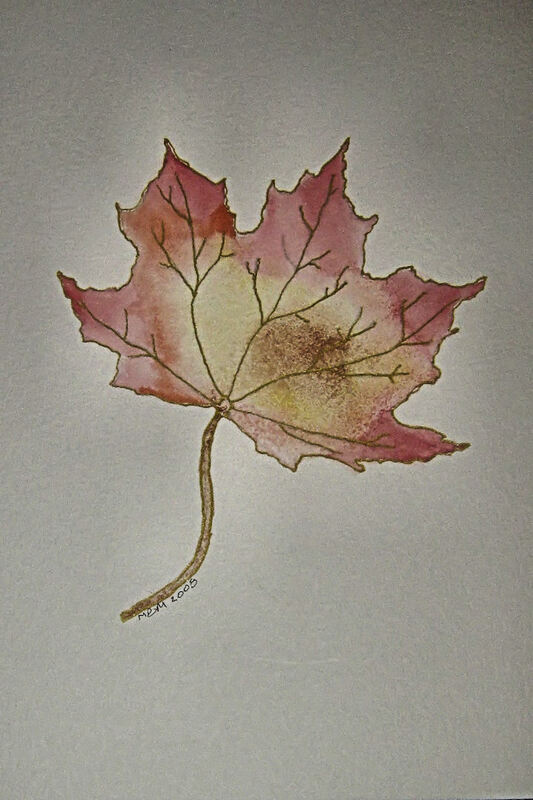 We used different techniques to affect the shading and textures on these leaves. 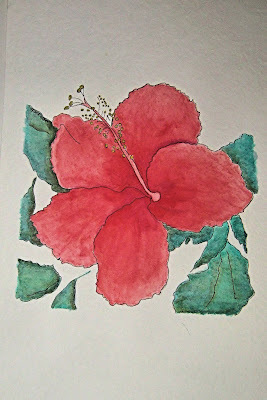 A pen and ink watercolor hibiscus, one of my favorite flowers to draw and paint. 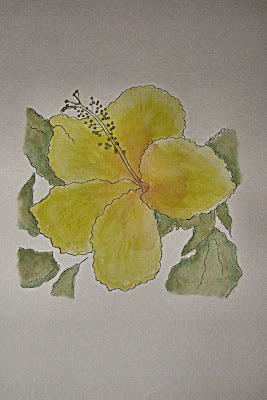 I think I used metallic pens to add some highlights to this painting but I don't think you can tell from this photo. Yet another hibiscus, this one I worked to teach using pen and ink and watercolor to teach blending and shading techniques. Pen and ink fuchsia flower. I matted and framed this to give as a gift to one of my family members. 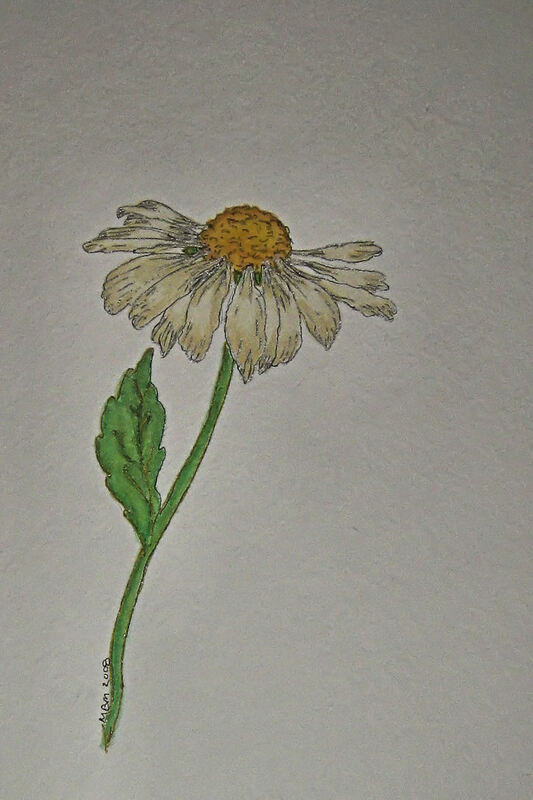 Watercolor, pen and ink daisy. This was one of my favorites, but it, too ended up as a gift. I love dragons! 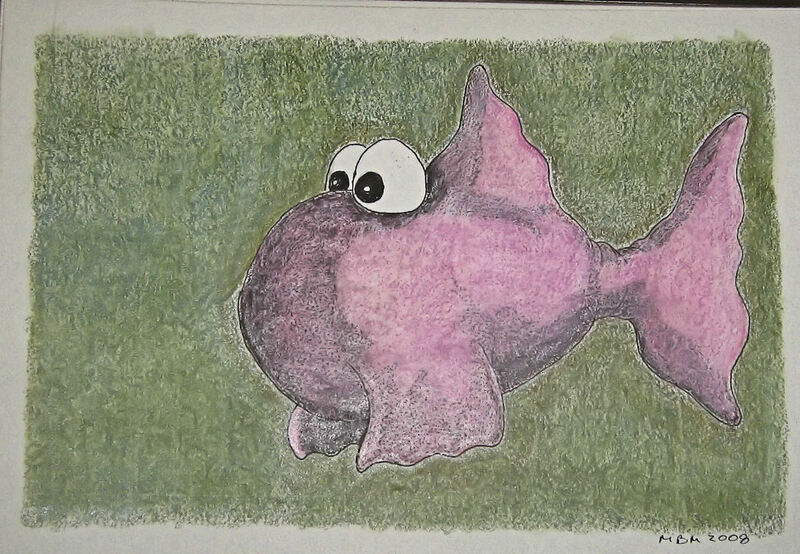 This is just a colored pencil sketch I did as a doodle, but I think he turned out pretty cute. 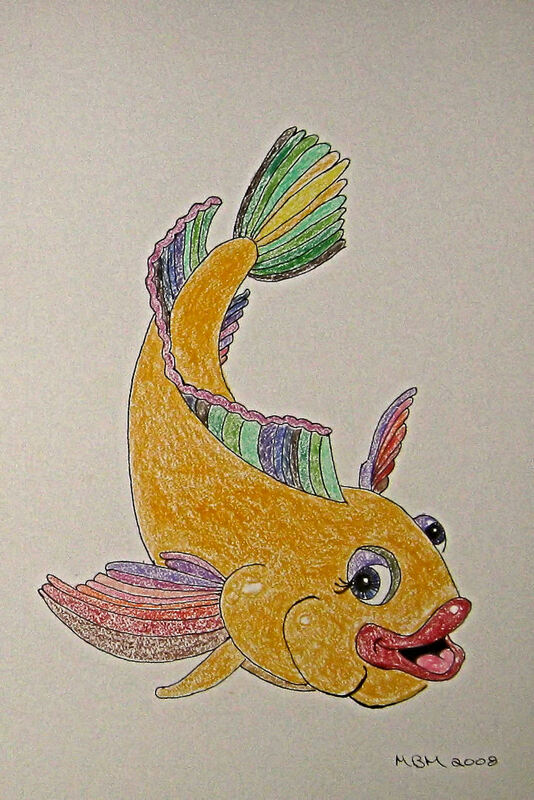 A goofy little colorful fish, done as a doodle from a free lesson on line. 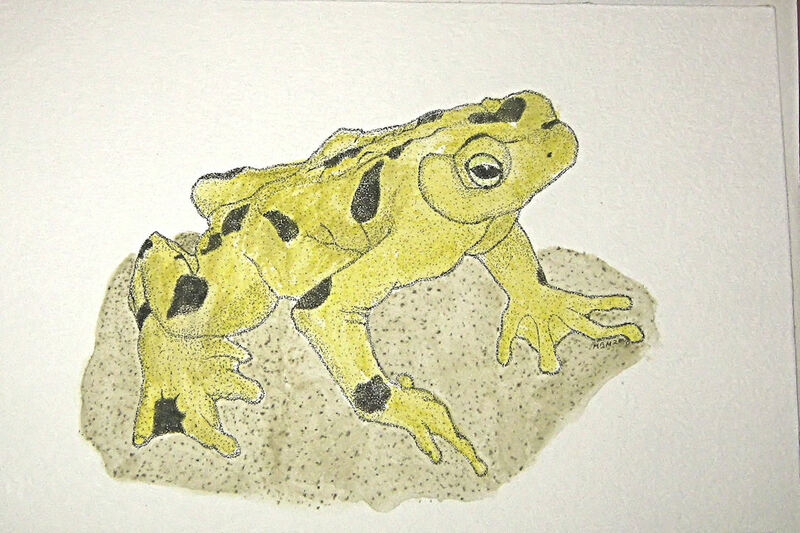 I might just frame him and hang him in our bathroom, though I am not too sure how well he will be accepted by all the butterflies flitting around in there. A colored pencil silly fish from a free lesson online. 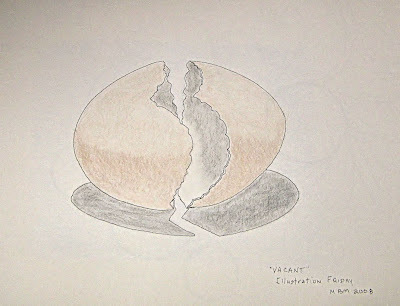 A colored pencil sketch I did to enter into the Illustration Friday competition. I never did work up the courage to send try entering it. 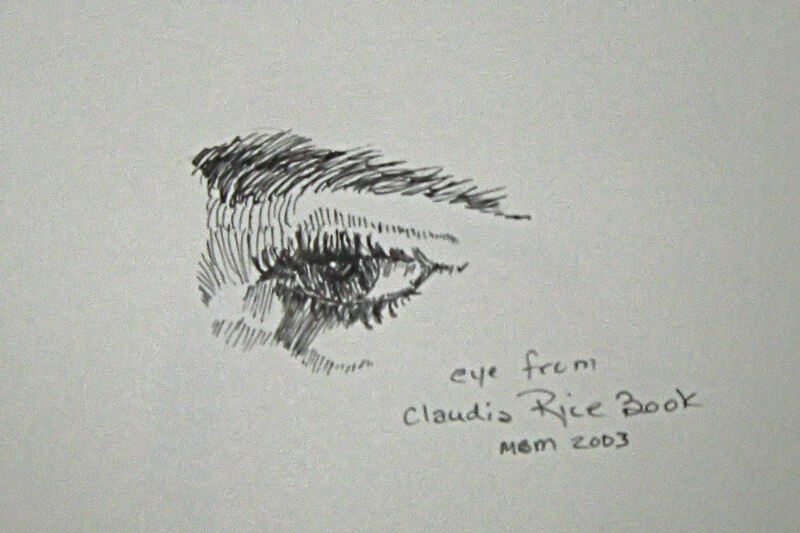 Eye study in pen and ink from one of my favorite artists books written by Claudia Rice. She makes one feel that anything is possible! 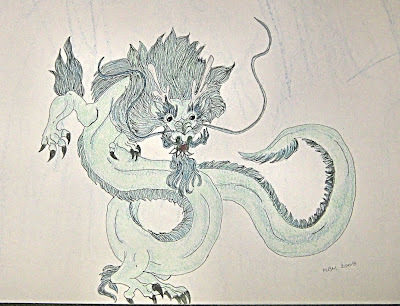 A Chinese dragon I did in Colored pencil and ink for my oldest daughter. 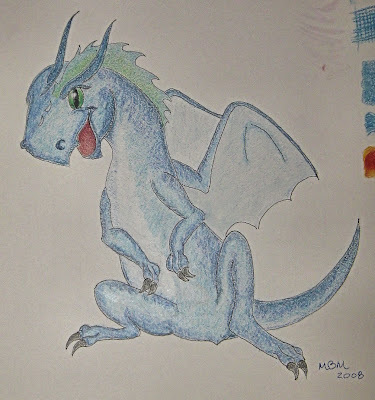 Unfortunately, she didn't seem too excited about it, so this poor lonelt dragon still haunts the pages of my drawing pad. This is a sun my granddaughter did free hand in watercolor. 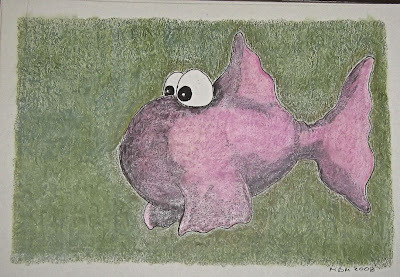 There's a lot of artistic talent in our family, not just painting and drawing, but fiber artists and green thumbs as well. Here's an egg study I did, practicing my shading techniques. I can't remember which book I got this exercise from, but it's probably still packed in one of the boxes out in our garage. African violets I did in pen and ink. Someday I hope to do this in watercolor as well as pen and ink. 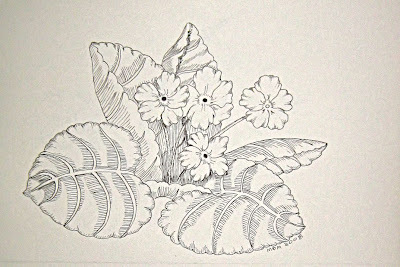 African violets are one of my mother's favorite flowers, and I'm thinking it might make a nice Mother's day gift for her. 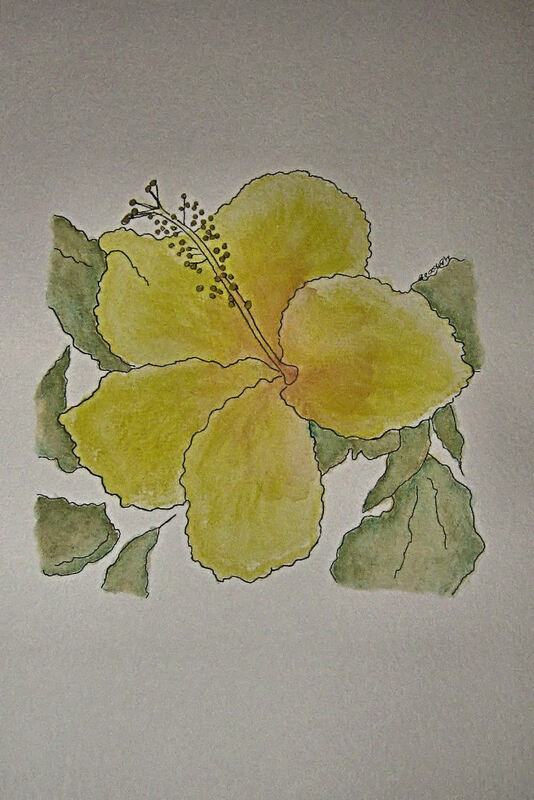 This was a lesson I taught in masking, splattering and blending as well as pen and ink. The class made a mess, but we were all happy with the results, even if they did end up a little abstract. 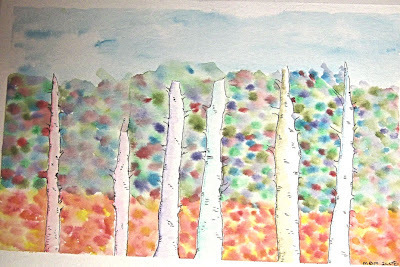 Can you tell the painting is of birch trees and fall leaves? 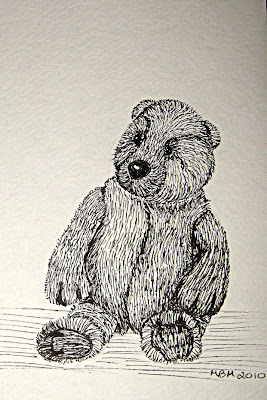 A five minute pen and ink sketch of a much loved teddy bear. So what about you? 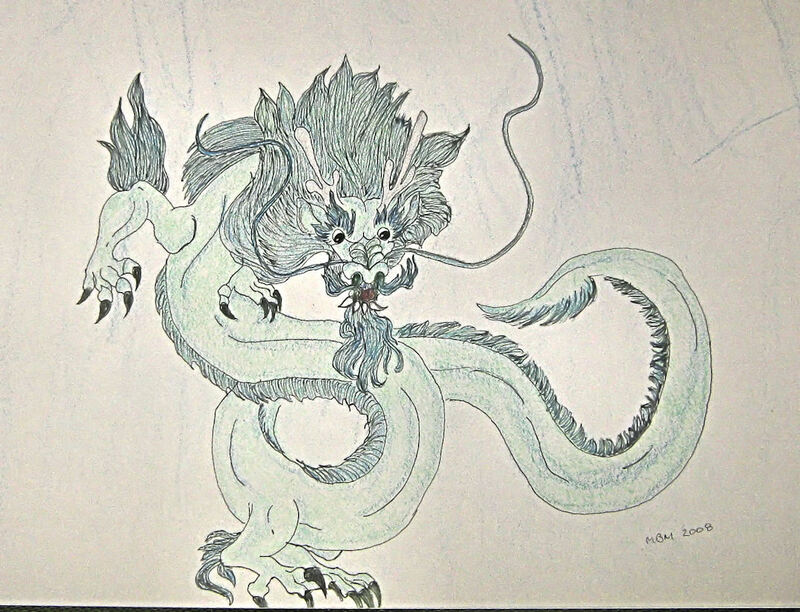 What other artistic talents do you keep hidden from the world? I dare you to share some samples with us, and I promise not to laugh at your if you don't laugh at mine! I'm still crocheting on my Aunt Mary's Sister shawl. I'm afraid I'm going to run out of yarn before I can finish it, but I'm going to work on it until I do. I'll share some updates soon! Until we meet again, Express YOURSELF! I'm now on row 23, and haven't had to frog the whole thing completely since yesterday. *Knock on wood. * I think the cape is coming along nicely. I don't dare crochet more than a couple more rows until I talk with my great-aunt again to find out some finishing details. I don't know for sure how long she wants this, or if she wants arm slits or not. 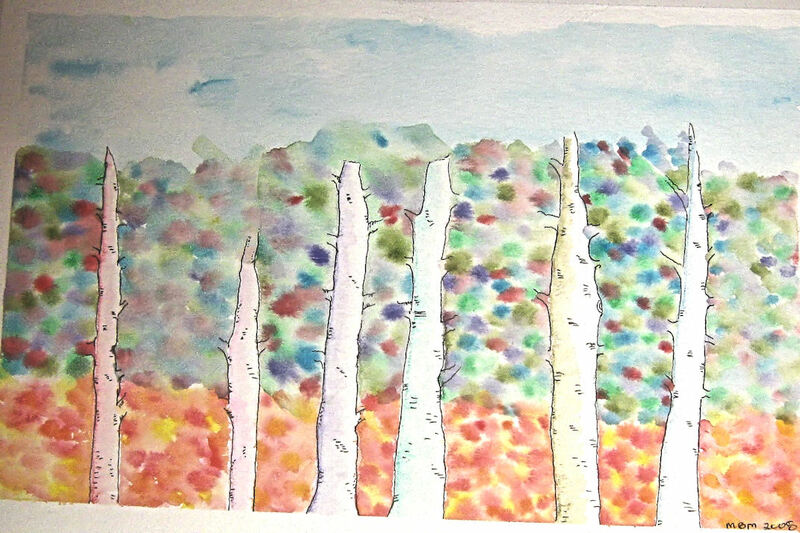 I do like the way it's turning out, but would love to hear your opinion. Also, I promised these update photo's ages ago, and haven't made it outside to get photo's yet, so I settled for a very wrinkled blue sheet as my back drop instead. 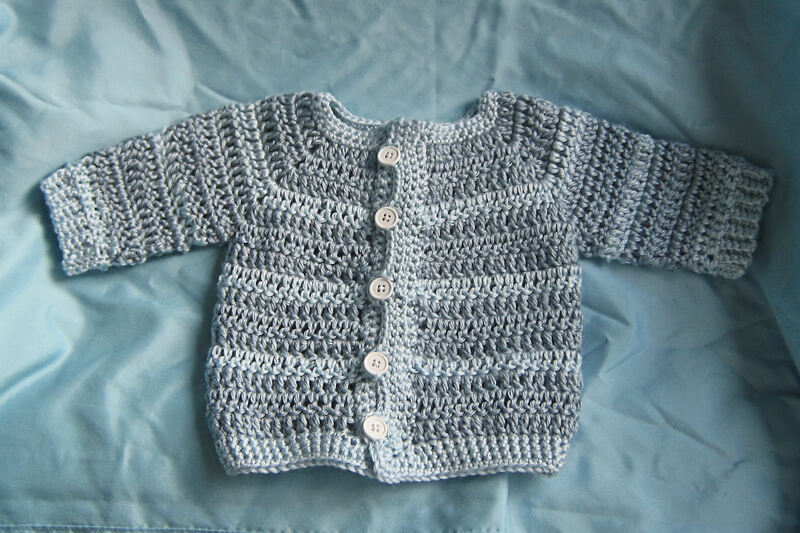 This is the jacket from the newborn Blue Leisure set I made a couple of weeks ago, I am not the happiest with the way the button loops look, I will not use this method again. I'm not very fond of sewing, either, so buttons are always the last thing on my 'To-Do' list. 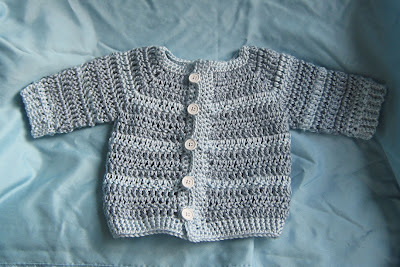 This is a dainty newborn girl sweater that I finished the other day. I found the free pattern here. And last but not least, I FINALLY finished the (not so) giant granny square baby blanket that is part of the Angel Baby Set I made. I'm so pleased with the way it turned out. What about you? What are your plans for today? Me, I'm going to work a couple more rows on the cape and then maybe get out into the garden for a little weeding. I'm making spinach gnocchi for our evening meal, and that takes quite a bit of time and effort. Homemade gnocchi is so very worth it, though. I tried to get some photo's of last nights Super Moon, but chose the wrong camera to use, so they didn't come out the best, but that's ok. I'm thrilled to be celebrating spring! 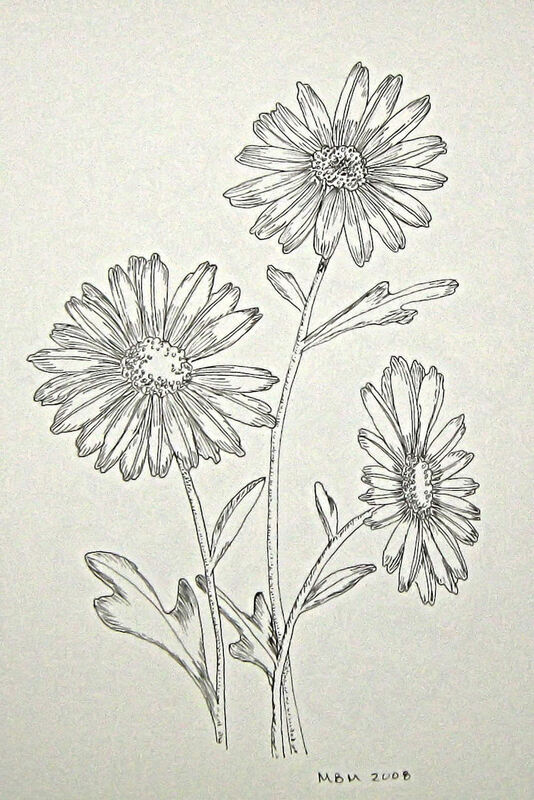 Happy Spring to you. I'm wishing you loads of new green growing things to bring you hope and joy! It's my own fault, I have no one else to blame. I can see this cape in my mind, and I know exactly how I want it to look. But did I ever stop and think of the stitches it would take, the increases or decreases needed to make it take that shape? N-o-o-o-o-o-o. And I know better! I really do. So now before I take my hook and yarn in hand again, I'm thinking and planning. I've finally stopped to ask myself, what do I have to do here. It's a slow process, but it's getting there. Hope you're having a wonderful weekend! I know I am, despite the challenges and all the frogs around me! It has been such a long, long, LONG time since I have tried to design a crochet pattern. In fact, I'm sure it's been years since I've done one! To make matters worse, I'm attempting to design an item of apparel, one thing that I haven't had a lot of experience doing. 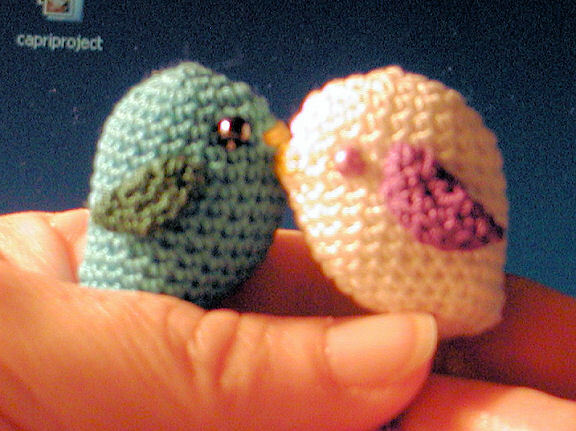 I'm much better at designing toys, amigurumi in particular. It's enough to make one's stomach tie in knots just thinking about it! 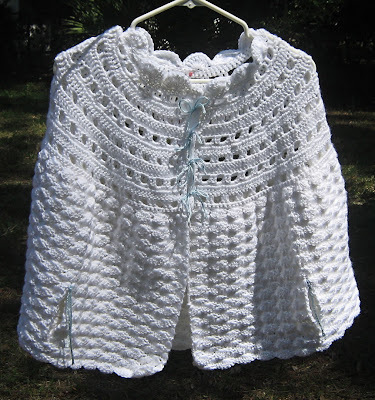 My favorite great aunt asked me if I would crochet a cape for her sister, and I readily agreed. We both looked over patterns, and she found one that she liked the looks of. Unfortunately, the pattern is in a book, and my local library does not have a very big selection of crochet books. I can't afford to buy any books right now. I don't feel right asking my great-aunt to buy a book that we only want for one pattern. So I took a closer look at the photo of the cape she likes, and thought, "I could do something like that!" Wish me luck. 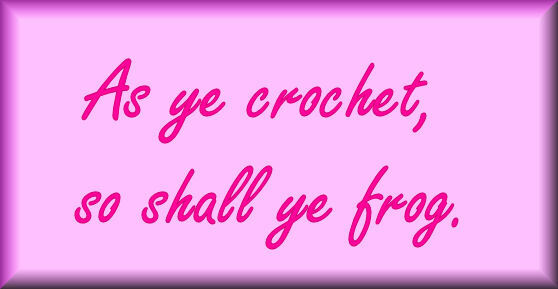 Hope the crochet goddess smiles down upon me, and speed my hooks and imagination to completion. If you're interested in seeing some of the crochet patterns I've designed in the past, you can find them stashed here. Happy hooking! I need a gardener! Honestly, my garden is in such a mess right now. Since I can't afford to pay for someone to come in and clean it, I've come up with an alternative plan. 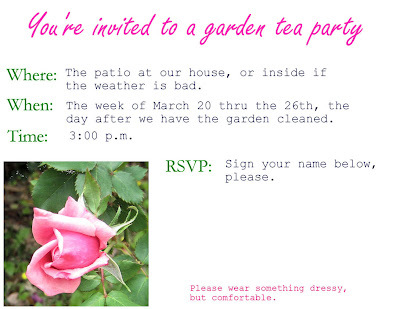 I'm going to have a Garden Tea Party! My granddaughter has the whole of next week off from school, and I've already informed here that WE ALL will be working on cleaning up the garden beds and planters. To make it a little more fun for her, and the rest of it, I decided to reward us with a tea party after we're finished. I made a invitation and posted it on our refrigerator door, planned the menu, and the decorations. Now I'm trying to decide on some party favors to make and give out. I'm also dreaming of what to plant in our newly cleaned garden. Last year we planted tomatoes, peppers, herbs and eggplants in our garden. We also have my rose bushes, a couple of hibiscus plants, a strawberry planter, an ivy planter, and a couple more planters that survived the bitter freeze we had this winter here in northeast Florida. 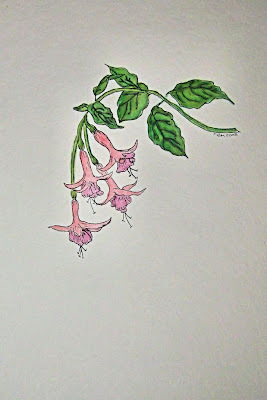 This year I want to do just flowers. Pansies. 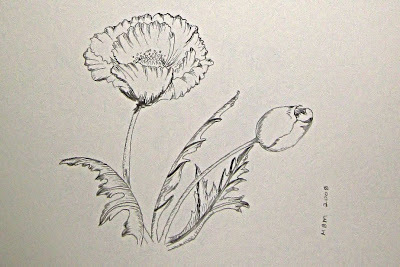 Marigolds. Violets. Others I haven't decided on yet. How about you? Do you have spring fever? Are you planning what to plant in your garden this year? Have you ever had or attended a garden tea party? Please consider sharing with me, I can use all the help I can get!